Deirdre has been employed as a lecturer in the Management Discipline since 1997.Prior to joining NUIG, Deirdre worked as an associate lecturer for the National College of Ireland and as an independent management consultant. Deirdre is actively involved in research into workplace mediation as a dispute resolution process. 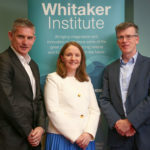 She leads a national level workplace mediation research group housed within the Kennedy Institute for Conflict Intervention at Maynooth University. Deirdre is the programme director of the MSc in Human Resources. She also currently acts as the Business School co-ordinator for the Chartered Institute of Personnel Development (CIPD). Deirdres primary research interests are exploring the impact of the law in bringing about change in workplace employment relations, and the value of mediation as an alternative to litigation. Other areas of interest include employee voice in the workplace, trade unionism, and processes for addressing workplace conflict - particularly mediation. (2018) Balancing Confidentiality and Transparency in an Ombudsman Mediation Service. (2016) Shaping the Agenda 2: Implications for Workplace Mediation Training, Standards and Practice in ireland. (2016) Shaping the Agenda 1: Exploring the Competencies, Skills and Behaviours of Effective Workplace Mediators. (2010) Quinn, M. and Curran, D. 2010, The impact of the Racial Equality Directive: a survey of trade unions and employers in the Member States of the European Union - Ireland. (2008) The Transposition of the European Employee Information and Consultation Directive Regulations in the Republic of Ireland. (2010) The impact of the Racial Equality Directive: a survey of trade unions and employers in the Member States of the European Union  Ireland, European Union Agency for Fundamental Rights, (FRA). (2009) The Impact of the Law in Bringing About Change in Workplace Employment Relations Practice, Irish Academy of Management Conference. (2009) The Effectiveness of the Selection Interview in the Primary Education Sector. Irish Academy of Management Conference Galway Mayo Institute of Technology Galway, Ireland. (2009) The Impact of the Law in Bringing About Change in Workplace Employment Relations Practice. Irish Academy of Management Conference Galway Mayo Institute of Technology Galway, Ireland. (2008) International Human Resource Management Human Resource Management : A Critical Text. (2006) Rationale, timing and adequate representation: on-going problematical issues in effective employee information and consultation. Irish Academy of Management Conference. Dr Deirdre Curran, Lecturer in Management at NUI Galway is the recipient of the prestigious national Teaching Hero 2014 award. The student-nominated award is the run by the National Forum for the Enhancement of Teaching & Learning in Higher Education chaired for Prof Sarah Moore. The award was presented by Dr Mary McAleese, former President of Ireland, and Patron of the National Forum. Deirdre contributes to a range of undergraduate and postgraduate programmes. A sample of her teaching commitments is included here. Deirdres teaching philosophy is to develop in students not only knowledge of the subject area but also the ability to think critically about the concepts, rationale and implications for life outside the university. Deirdre constantly strives to improve the quality of her inputs by involving students in their own learning and using innovative learning techniques.